Apresentação no 11th ​ACM / IEEE International Symposium on Empirical Software engineering and Measurement (ESEM), no Canadá. O ESEM é é a principal conferência para apresentar os resultados de pesquisas relacionados àempirical software engineering. O trabalho, em formato de poster, foi apresentado pelo professor Guilherme Travassos. Abstract— Background: research synthesis is still challenging in Software Engineering due to the heterogeneity of primary studies in the area. Also, it generates a significant volume of information which is complex to manage. Aims: to provide support to this kind of studies in SE. 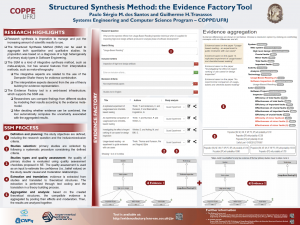 Method: we present the Evidence Factory, a tool designed to support the Structured Synthesis Method (SSM). SSM is a research synthesis method that can be used to aggregate both quantitative and qualitative studies. It is a kind of integrative synthesis method, such as meta-analysis, but has several features from interpretative methods, such as meta-ethnography, particularly those concerned with conceptual development. Results: the tool is a web-based infrastructure, which supports the organization of synthesis studies. Researchers can compare findings from different studies by modeling their results according to the evidence meta-model. After deciding whether the evidence can be combined, the tool automatically computes the uncertainty associated with the aggregated results using the formalisms from the Mathematical Theory of Evidence. Conclusion: the tool was used in real synthesis studies and is freely available for the SE community. Para mais informações, acesse o link da conferência.